Speaking involves controlling parts of the mouth and nose to shape the air that comes from the lungs. 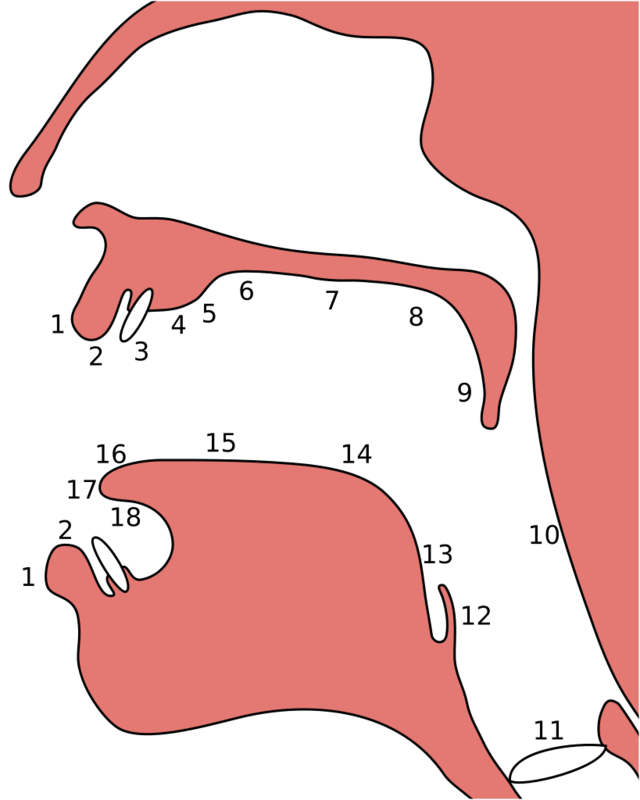 This unit introduces the names and locations of the articulators that are used to produce the sounds of English: the tongue, lips and teeth, the alveolar ridge, the palate, the velum, and the nasal cavity. 1. Which articulators are responsible for the first sound in the word minor? 2. Which articulators are responsible for the final sound in the word wit? 3. Which articulators are responsible for the first sound in the word photography? We know that humans produce speech by bringing air from the lungs through the larynx, where the vocal folds might or might not vibrate. That airflow is then shaped by the articulators. This image is called a sagittal section. It depicts the inside of your head as if we sliced right between your eyes and down the middle of your nose and mouth. This angle gives us a good view of the parts of the vocal tract that are involved in filtering airflow to produce speech sounds. Let’s start at the front of your mouth, with your lips. If you make the sound “aaaaa” then round your lips, the sound of the vowel changes. We can also use our lips to block the flow of air completely, like in the consonants [b] and [p]. We also use our teeth to shape airflow. They don’t do much on their own, but we can place the tip of the tongue between the teeth, for sounds like [θ] and [ð]. Or we can bring the top teeth down against the bottom lip for [f] and [v]. If you put your finger in your mouth and tap the roof of your mouth, you’ll find that it’s bony. That is the hard palate. English doesn’t have very many palatal sounds, but we do raise the tongue towards the palate for the glide [j]. When we block airflow in the mouth but allow air to circulate through the nasal cavity, we get the nasal sounds [m] [n] and [ŋ]. The articulator that you move to allow air into the nasal cavity is called the velum. You might also know it as the soft palate. For sounds made in the mouth, the velum rests against the back of the throat. But we can pull the velum away from the back of the throat and allow air into the nose. We can also block airflow by moving the body of the tongue up against the velum, to make the sounds [k] and [ɡ]. Farther back than the velum are the uvula and the pharynx, but English doesn’t use these articulators in its set of speech sounds. Every different configuration of the articulators leads to a different acoustic output.